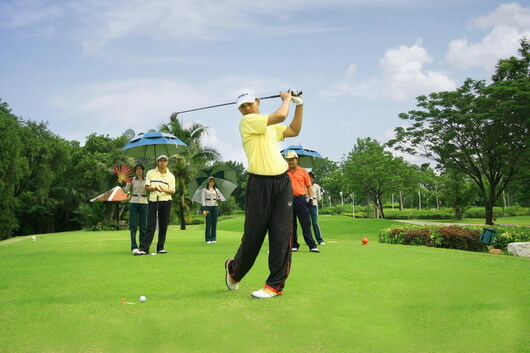 Thailand is the most popular golf vacation destination in the world. Most noteworthy is the tropical holiday climate, beautiful scenery, white beaches, shopping opportunities and friendly people. And above all the amazing golf courses. We can also tailor a golf holiday custom package made on your specific requirements. Enjoy a break with golf and time away in the Venice of the East. 3 days / 2 rounds of best value quality golf from THB 9,600. 3 days / 2 rounds of the best Championship golf from THB 14,400. Experience a golf tour at stunning venues in the City of Angels. 5 days / 4 rounds of high quality golf from THB 17,600. 5 days / 4 rounds of Championship golf from THB 26,000. Play magnificent golf courses and explore buzzling Bangkok. 7 days / 5 rounds of selected quality golf from THB 22,500. 7 days / 5 rounds of amazing Championship golf from THB 33,000. 3 days / 2 rounds of top quality golf from THB 7,800. 3 days / 2 rounds of Championship golf from THB 10,300. 5 days / 4 rounds of quality golf from THB 15,600. 5 days / 4 rounds of Championship golf from THB 19,300. Enjoy a break with golf and natural beauty in Chiang Mai. 7 days / 5 rounds of Northern quality golf from THB 19,900. 7 days / 5 rounds of the best Championship golf from THB 25,600. Chill-out with a golf break in tropical Hua Hin. 3 days / 2 rounds of high value and quality golf from THB 10,700. 3 days / 2 rounds of the best Championship golf from THB 12,900. Book a golf tour and stay at a calm seaside resort in Hua Hin. 5 days / 4 rounds of top quality golf from THB 19,300. 5 days / 4 rounds of Thai Championship golf from THB 22,900. A week in Hua Hin with golf at some of the best courses in Thailand. 7 days / 5 rounds of true quality golf from THB 25,300. 7 days / 5 rounds of thrilling Championship golf from THB 29,900. Take a break with golf and ocean breeze in the capital of fun. 3 days / 2 rounds of best quality golf from THB 8,900. 3 days / 2 rounds of true Championship golf from THB 12,700. Enjoy golf tour, shopping and nightlife in Pattaya. 5 days / 4 rounds of quality golf from THB 15,800. 5 days / 4 rounds of amazing Championship golf from THB 24,400. Relax a week with top golf courses, hot beaches and seafood in Pattaya. 7 days / 5 rounds of challenging quality golf from THB 19,800. 7 days / 5 rounds of top Championship golf from THB 30,100. Take a golf break on sunny Phuket Island. 3 days / 2 rounds of high quality golf from THB 11,200. 3 days / 2 rounds of amazing Championship golf from THB 15,500. Enjoy a golf tour with world class hospitality in Phuket. 5 days / 4 rounds of high value golf from THB 20,900. 5 days / 4 rounds of true Championship golf from THB 25,600. A week with golf, white sand beaches and tasty local cuisine. 7 days / 5 rounds of quality golf from THB 27,000. 7 days / 5 rounds of beach Championship golf from THB 31,700.